Bone, human hair, synthetic hair, fabric, beeswax, cormorant foot, coyote fangs, waxed linen, gull wing, found doily, calf jaw bones, leather, silk ribbon. 'Murmet' is another word for 'scarecrow' in Devon, UK. Mumble is Murmet's little pet and loves to hang around. Murmet wears Mumble like an accessory. Murmet is a netted coyote skull with a waxed fabric beak - his/her body is also waxed fabric, stuffed with human hair and wool. 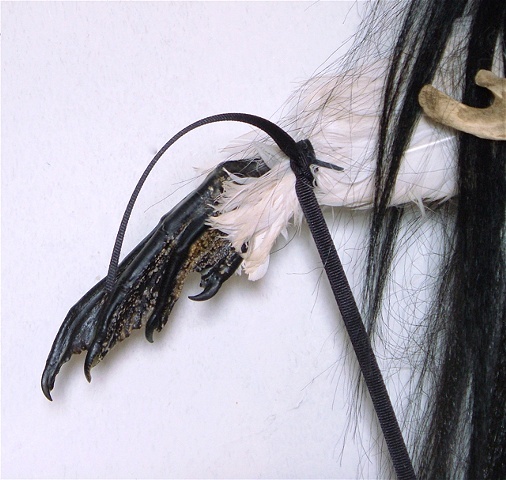 Murmet is crowned with both synthetic and human hair, has a dried and waxed cormorant foot on one white-winged arm and a bone for the other arm. Murmet's front pouch is a vintage doily, waxed and carrying two small jaw bones. Mumble is a hairball with coyote fangs, dangling precociously and wearing a darling silk ribbon tied in a bow.